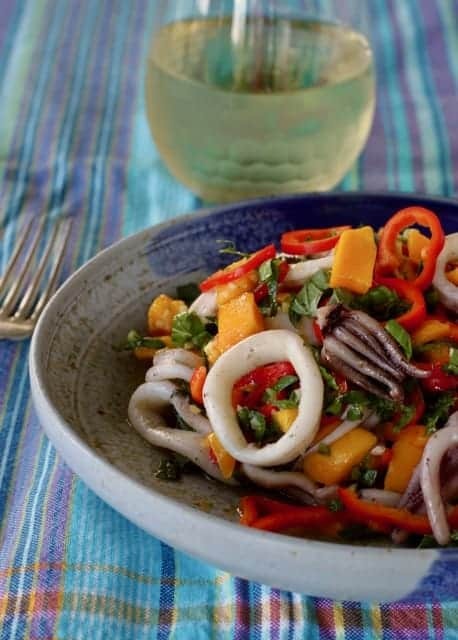 Grilled Squid (calamari) Mango Salad is filled with fresh Asian flavors of mango, lime juice, jalapeno, and ginger. A delicious, easy, healthy summer salad in about 15 minutes. When you think of grilling, a sizzling burger might come to mind. Or a pork chop. Have you thought of squid? Squid meat has a mild flavor and firm, chewy texture. Many of us have probably eaten calamari battered, fried and dunked in a sauce. That’s squid. Part of the mollusk family, this prehistoric creature with its ten arms, is related to the octopus. They are popular in Mediterranean and Asian cuisines, in seafood restaurants and bar menus. 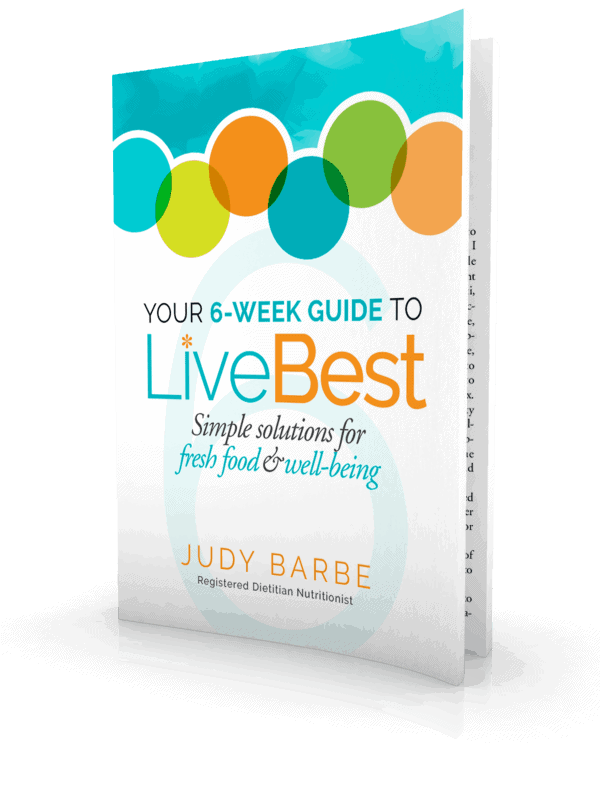 Nutrition guidelines recommend 2 servings of fish per week, 3 to 4 ounces each, for the lean protein and heart-healthy omega-3 fats they provide. Two servings seems worth it because observational studies show that people who eat more fish are at reduced risk for heart attacks and stroke than those who eat less fish. When it’s battered and fried, the healthful benefits get lost. So baked, steamed, or grilled fish is best. 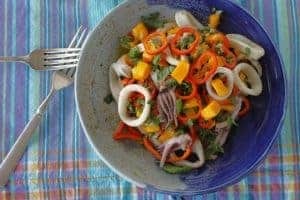 This grilled squid salad is filled with fresh Asian flavors from a dressing of mango, lime juice, fish sauce, jalapeno, ginger and herbs. Together, they make a delicious summer salad in about 15 minutes. Squid is sold fresh and frozen. If buying fresh, look for clear eyes and a fragrance that reminds you of the ocean. Cook it within a day or two. Shop frozen for a longer shelf life. Thaw in the refrigerator before cooking. Overcooking toughens squid so you feel like you’re chewing on a rubber band. Moderate temperature and short cooking time prevents that. Short is about 5 minutes. You may find whole squid or cut into rings or strips. Any form works in this recipe though the whole squid may be easier to grill. If using rings, a grill basket or cast iron griddle keeps it from falling through the grates. 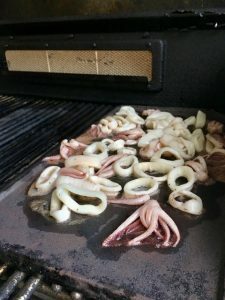 Grilling squid – just a few minutes does it! A mango can be a challenge to cut until you know to cut around the large, flat seed in the center. Wash the fruit, set it on a cutting board and slice lengthwise about 1/4-inch off of center, so your knife runs along one side of the seed. Repeat on the other side. You’ll end up with two “cheeks” of flesh. 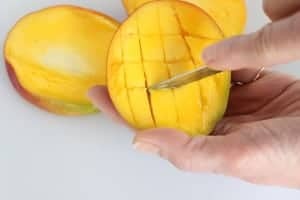 Use a small, serrated paring knife to cut around the mango between the skin and the fruit. The knife shouldn’t penetrate the skin. Cut a tic tac toe pattern. Push the skin up, so it turns inside out. The flesh will pop up and you can trim the cubes away from the skin. To buy mango, choose it based on firmness and when you plan to eat it. Color does not indicate ripeness. Squeeze the fruit gently. A ripe one will give slightly. Mangoes ripen at room temperature, becoming sweeter and softer over several days. To speed up ripening, place them in a paper bag at room temperature. 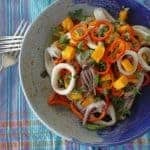 Grilled Squid Mango Salad is filled with fresh Asian flavors of mango, lime juice, jalapeno, ginger and herbs. Together, they make a delicious, easy, healthy salad in about 15 minutes. 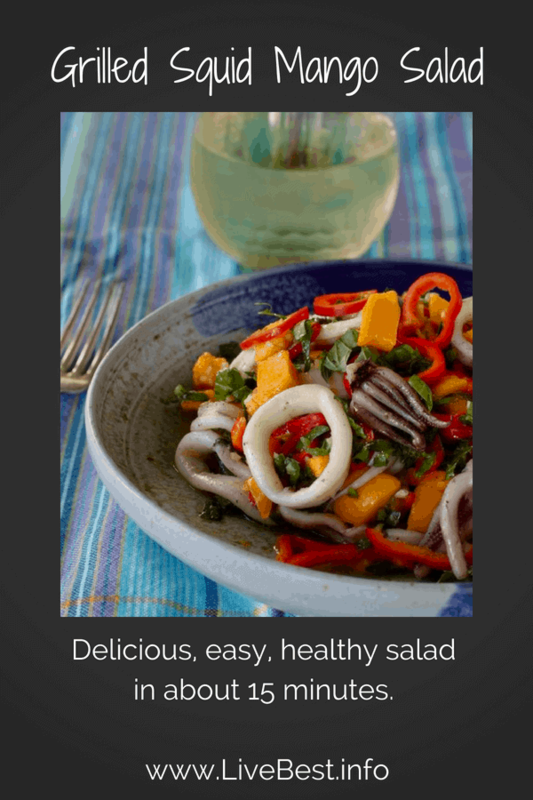 Serve this salad with warm squid or chill for a cold salad. Squid: Rinse squid. Pat dry. In a medium bowl, toss squid with 1/2 teaspoon oil. Grill over medium heat 3-5 minutes in a grill basket or griddle. Overcooking toughens the squid. Note: You can also cook the squid in a pan over medium heat. Dressing: Whisk together olive oil, lime juice, jalapeño, and ginger. 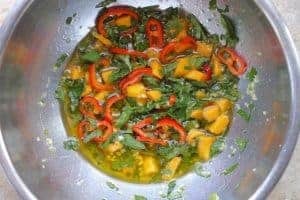 Stir in herbs, squid, mango, and peppers. Stir to coat all ingredients.